Roadmap to the Crimson Throne! The Curse of the Crimson Throne Adventure Path introduces you to the sprawling city of Korvosa, the largest city in all Varisia. As things go from bad to worse in Korvosa, you'll explore hidden temples, underground warrens, thieves' guilds, and noble palaces. Eventually, you'll even head out into the world to explore haunted castles, barbarian encampments, and ancient ruins from ages past. 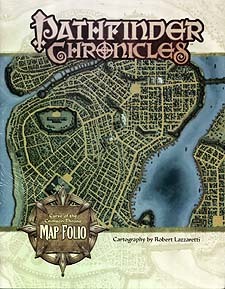 The Curse of the Crimson Throne Map Folio contains reprinted maps of all the key locations explored in Pathfinder's second Adventure Path. Even if you aren't running Curse of the Crimson Throne, the maps inside can serve as cities, dungeons, castles, and worlds for any RPG campaign. In addition, inside this folio you'll find two huge poster maps, one of the entire region of Vairsia, the setting for the Curse of the Crimson Throne Adventure Path, and one of the city of Korvosa, your PCs' hometown and the focal point of the entire campaign!